Quite Contrary from Riley Blake Designs is currently one of my favorite collections! I wanted something frilly and ruffly! I just know she will love it! The main body of the apron is about 1/2 yard of fabric and then I just added 1/4 yard ruffles, folded in half. Oh yeah, and some Jumbo ric rac to finish it off! It is just too cute to pass up! Be sure to get your orders in for Fruitcake posted below, that sale ends Wednesday! We are clearing out EVERYTHING! 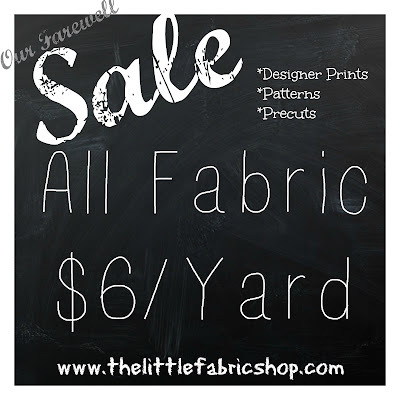 Thelittlefabricshop.com provides a great selection of designer prints, patterns and trims at affordable prices. The Little Fabric Shop. Simple theme. Theme images by Ollustrator. Powered by Blogger.